Tomato season has begun. One can find numerous recommendations regarding growing tomatoes in literature or just by asking for advice from experienced gardeners. But little do know, that professional vegetable farmers in Lithuania have a unique assistant helping them – bumblebees. In current day’s modern vegetable greenhouses, bumblebees are increasingly more popular for pollination. Pollinated bunches are known to yield larger amounts of fruit and ensure a better harvest. As Mr Nerijus Rakickas, head agronomist of Kietaviškių gausa, believes, the impact of bumblebees is clearly visible: “Not only do we get a better yield, the fruit are larger and riper, and the quality is much better – we save a lot of time and effort and we can move our attention to other tasks at hand”. The bumblebees start their shift as soon as the first plants start to bloom. This year, around 4 hectares of land is dedicated to tomatoes – around 100 thousand plants in total. Mr Karolis Montvila, the business development manager of the firm, says that the first tomato is harvested at the end of April, but depending on the climate and other environmental factors, the whole thing can drag out a little longer. Tomato season is usually over at the end of October. “At this point in time, we’re undergoing a reconstruction. The innovations that we’re planning to bring in will allow us to grow vegetables all year round, which means – fresh Lithuanian vegetables accessible all year round. Of course, the bumblebees will be helping us – we import them from the Netherlands.” – says Mr Montvila. One can definitely ask – why do we use bumblebees and not bees in our greenhouses? Kietaviškių gausa‘s agronomist Mr Rakickas believes, that they‘re more productive. „We use Kopper bumblebees from the Netherlands. We order them specially for pollinating tomatoes, and these type of bumblebees can hardly be found locally. One bumblebee is as productive as 4 or 5 bees“. A dozen swarms is enough for all the tomatoes. By the end of the season the tomato plants can reach up to 10-11 meters. Three seedlings can reach up to a 40 kilogram yield. Mr Montvila assures, that using bumblebees for growing vegetables is a widespread practice. „Bumblebees are active even when the sun is not out. They are larger and less aggressive, and we bring them to our greenhouses in Winter, so that as soon as Spring comes and slumber ends, they can instantly start working on pollinating the plants“. The bumblebees live in special hives above the vegetable beds. Approximately 30 to 35 hives are needed for one hectare of plants. „One hive usually hosts one family – it‘s around 50-60 grown ones and several small ones or even unhatched ones, who later substitute the grown bumblebees, when their work is over“ – says Mr Rakickas. Once every one or two weeks, Kietaviškių gausa raises a few new hives in their greenhouse. It is estimated, that one hive can work on the tomatoes from 6 to 8 weeks, however, according to the agronomist, and a lot rides on the intensity of vegetable growth. 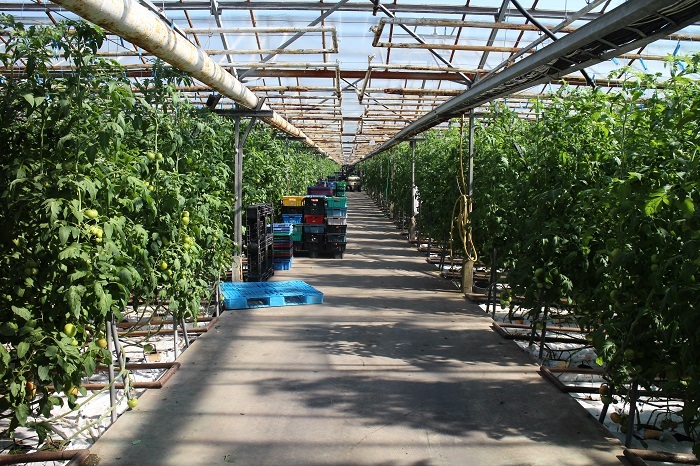 For a while, an early and productive breed of tomatoes is planted in Kietaviškės – Admiro. The fruit is thick and tasty and of very high quality. These seedlings cover the largest part of the land. Currently, the firm employs 12 hectares of land for planting vegetables, which, after the reconstruction is finished, will increase to 20 hectares.